When I moved into my new house in June 2011, I was very happy to have all the mature trees, rose garden and an established lawn. The back yard had two big palm trees and two smaller green leafed trees which provided really nice shade. Well, I was busy moving in and unpacking, then working and blogging and I didn’t go in the back yard at all, until a couple of months later. And lo and behold, one of the small trees had little green citrus fruits of some kind all over it. A couple of months after that it was covered with hundreds of huge oranges. So many, we didn’t know what to do with them. You guys with all the zucchini have nothing on us, believe me. I have never had any kind of fruit tree in my yard anywhere I’ve lived, so this is such a revelation. If I want an orange, I walk 20 feet and pick one. We even found an orange picker on a pole in the garage, so we could get the ones on the top. So we have been eating a lot of oranges and I have had to get creative to use them up. That is where this recipe came from. Desperation. To use up the oranges. And now that there are only a few oranges left on the tree, there are hundreds, maybe thousands, of new little ones about the size of a walnut busily growing bigger. And bigger. It’s a good thing they are seedless, brightly sweet-tart, juicy and really delicious. While I was shooting this salad, my 24-year old son, Brian, came in and asked what smelled so good. Orange salad, I answered. He came over and inspected my photo setup. Oh, that’s really beautiful, he said. He wandered into the kitchen and discovered the bowl with the remainder of the salsa. He grabbed a spoon and took a big bite. Oh my god, this is delicious! !, he exclaimed. Can I have the rest of this? I’m eating this, he proclaimed, whether you like it or not. And waltzed off with the bowl. Well, maybe it won’t be so hard to use up all those oranges after all. 1. Place all vinaigrette ingredients in a small bowl and whisk to emulsify. Reserve. 2. Remove peel from oranges with a large sharp knife. Slice oranges into ½-inch slices. 3. 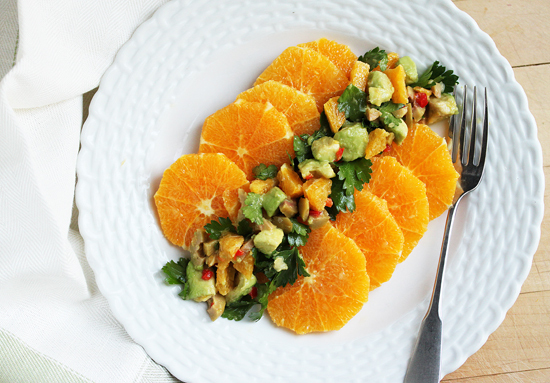 Cut rounded end pieces of orange into ½-inch dice and place in a large bowl along with the diced avocado, chopped green olives and parsley leaves. 4. Pour enough of the reserved vinaigrette over salsa ingredients to thoroughly moisten. 5. 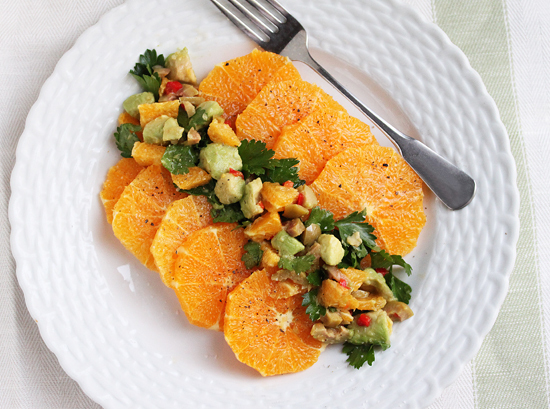 Layer orange slices on serving plates and place salsa over or next to oranges. Drizzle orange slices and salsa with remaining vinaigrette. Lightly dust orange slices with kosher salt and black pepper if desired. Serve. i absolutely love oranges with savory flavors. ever since i was a kid i liked salt on fruit… lucky you… make marmalade? Beautiful oranges! How lucky you are to have them in your yard!!! I hope my son gobbles up my salsas one day! (He’s still picky at 8.) 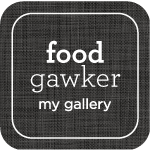 I love your post on Geez Louise today, too! Yummy! 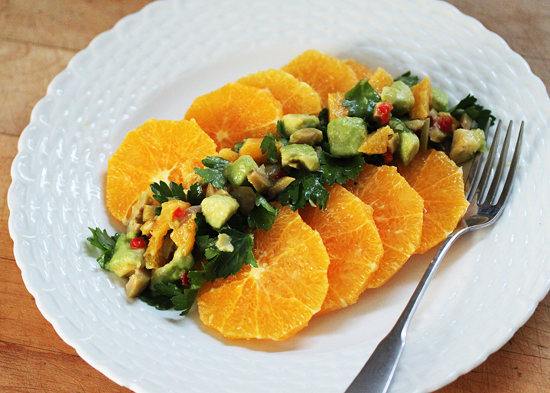 I love oranges and avocados together! Adding olives to the mix is a fun new twist for me. I can’t wait to try it! 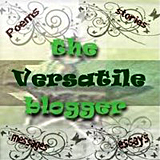 I found your blog while looking through the list of Camp Blogaway attendees. Looking forward to meeting you! Thanks too for the posts about the photography classes. I’ve always wanted to take some classes, and your posts have inspired and encouraged me! 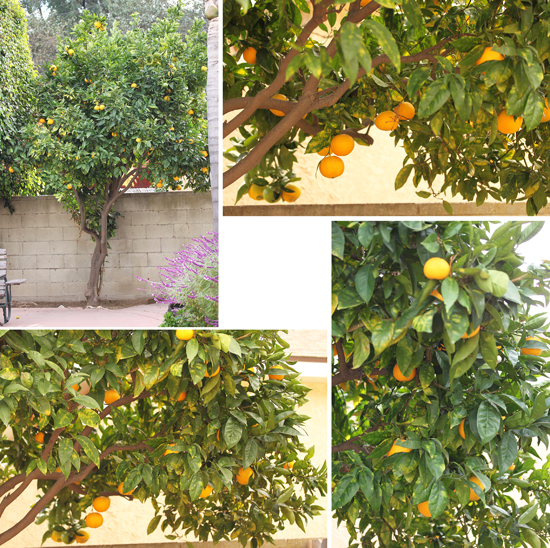 So glad to see your orange tree! Isn’t farming fun?! Wow, that photography class really paid off if your finished dish picture is an example of knowledge gained. Great recipe too! Isn’t it great when your backyard can inspire what you eat?! I have the same problem with Meyer lemons and tangerines. Wanna trade?! Your salad is gorgeous, and I agree with your son. Love oranges and olives, recipe looks divine! Love the color combination. Your photos are beautiful. It looks really pretty and inviting! Thank you for sharing.